When you are investing online, keeping up with what’s going on in the world of finance is key to financial success. To make informed decisions, you can monitor industry changes, company mergers, market momentum, and other investment-related details. Specialized boutique research firms: These guys closely track an industry or a collection of related industries called a sector. These firms usually charge large sums for their research. Sometimes, though, they provide useful industry data on their websites for free. You can usually find them by searching for “research” and the name of the industry in most search engines. Industry associations: Typically, the easiest way to find such groups is by just entering the name of the industry into a search engine and see what that turns up. Pay services: Hoovers.com provides full reports on a wide range of industries to subscribers. Standard & Poor’s also publishes industry surveys, but they can cost hundreds of dollars. The U.S. government: The U.S. Department of Labor’s Bureau of Labor Statistics maintains a set of comprehensive industry data that’s free to the public. Competitor information: Yahoo! Finance lists the main rivals of any company. Just enter the stock symbol of the company into the Enter Symbol(s) text field on the home page and click the Get Quotes button. Next, click the Competitors option under the Company heading. Competitor filings: Using the Securities and Exchange Commission’s database, you can look up regulatory filings made by competitors. Reuters: Provides statistics that allow you to easily compare a company’s performance to that of its rivals. Enter the name or symbol of the company you want to learn more about in the Search Stocks blank and click the Search button. After selecting the company from a list, click on the Financials tab. When you scroll down, you’ll see how the company sizes up in the industry based on everything from sales to profit. S&P Dow Jones Indices: This industry heavyweight provides detailed and free information on corporate profit growth of different sectors. 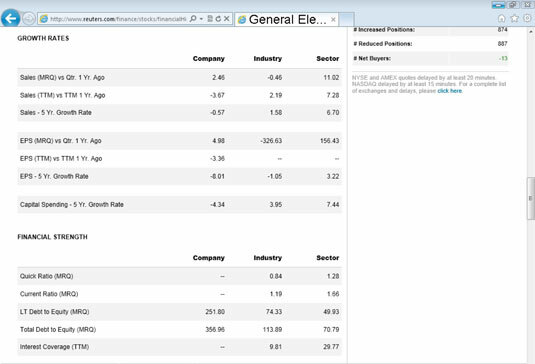 Click the Additional Info button, and then click the 500 Basic Earnings and Estimates (EPSEST) link. On the spreadsheet that pops up, check out the Estimates & PEs tab for data on the sectors. Press releases: Regulators require that such releases be put out the moment a company announces a significant personnel change. AFL-CIO CEO Pay Database : This Web site provides data on the comings and goings of corporate executives, with a focus on how much the people at the top are getting paid. GMI Ratings: This particular website closely tracks trends and data on executives. It has a database, for instance, that can tell you which executives hobnob with each other by sitting on corporate boards together. Most of the data, though, must be paid for and the charges can vary. mergermarket: This site offers comprehensive merger-tracking information. FactSet Mergerstat: This Web site provides some free data about the merger-and-acquisition market if you register. Yahoo! Finance: Count on Yahoo! to summarize all its M&A news in one place. Chicago Mercantile Exchange is home for the trading of many financial instruments including futures and options, making it a good place to see the prices of different foreign currencies. But it’s also home to many agricultural product tradings, including pork bellies and live cattle. Bloomberg maintains a relatively easy-to-read and -understand table of most of the commodities you’re likely to care about. BigCharts.com This site has a BigReports tab that gives you access to all the stocks with the biggest moves. USATODAY.com: Click the Most Active Stocks header located near the top of the page to see which stocks investors are making heavy bets on. Morningstar.com: This page of the Morningstar.com site provides an update on the market during the day. It shows you which stocks on all the major U.S. stock exchanges are rising or falling by the largest amounts. Stocks can be sensitive to changes in the yield on debt sold by the U.S. government. Investors keep a close eye Treasury notes that mature in ten years or less and Treasury bills that mature in less than a year. The yield on Treasuries is important because it indicates what return investors can expect in exchange for taking no or low risk. StockCharts.com: This Web site shows you, graphically, how the yields for short-term Treasuries compare with yields for long-term Treasuries. Fidelity’s Historical Yield Curve: This site plots the yield curve and also helps you understand it by explaining what it means if short-term rates are higher, lower, or equal to long-term rates.